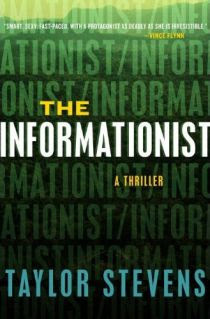 The Informationist by Taylor Stevens will be released on March 8, 2011. Gripping, ingenious, and impeccably paced, The Informationist marks the arrival of a thrilling new talent. I'm a big fan of Lisbeth Salander's character. We need more kickass women like her in our thrillers. I'm hoping Vanessa “Michael” Munroe will live up to the hype. That particular blurb is what originally pulled me in to wanting to check out this book. Cut off from personal family, at times under the care of sadistic individuals and without access to books or television from the outside world, imagination became a survival mechanism. As a young teenager, I secretly entertained commune children with fantastic stories that took us through time and space, until these sins were discovered by cult leaders. Several laboriously hand-written books were confiscated and burned and I was ordered on pain of – well, a whole lot of pain – never to write again. You can read the rest of the author's biography here. Hmmm, thanks for the tip. You're absolutely right - we need more kickass women like Lisbeth, so here's hoping this lives up to the hype. ummmm sounds really good not my normal type of read but I hope you get to enjoy it.